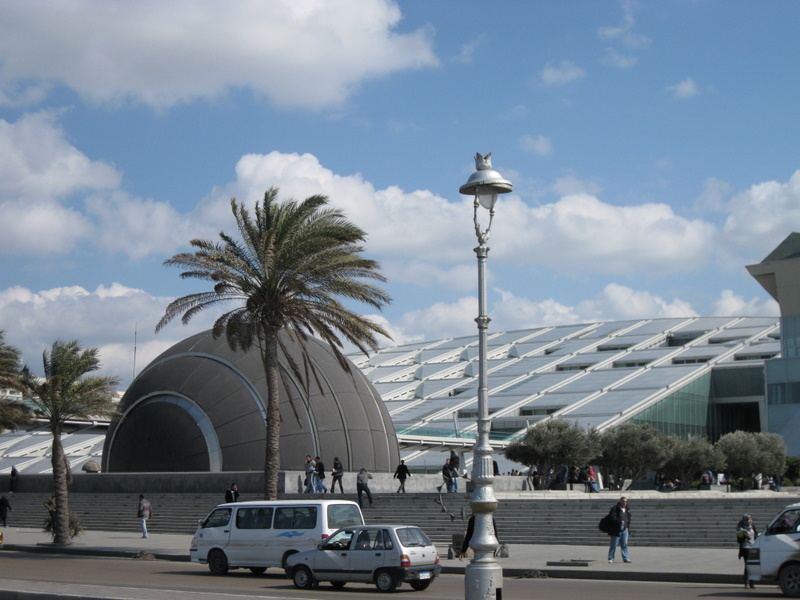 In order to fly from Athens to Morocco, it was cheaper to have a layover in some European airline hub than to fly directly. So I chose Paris in order to go to Normandy. 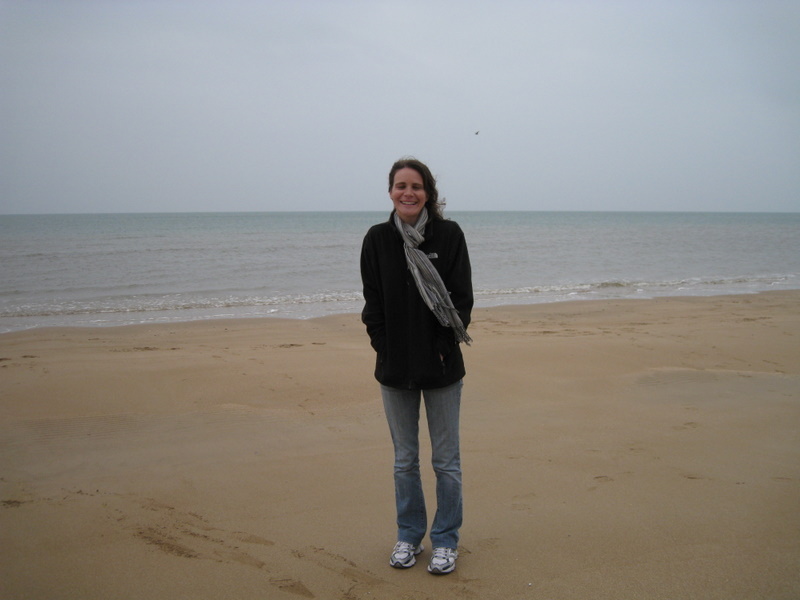 When I first was in Paris several years ago, a combination of poor planning and a French train strike resulted in an ill-fated attempt at seeing the famous WWII beaches. Attempt number two was much more successful. 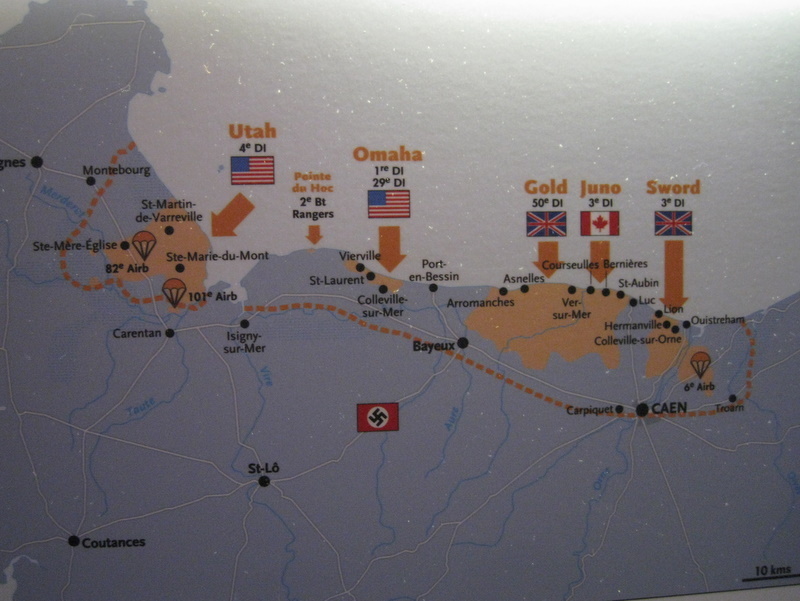 I took a two hour train from Paris to Caen, where the Caen Memorial Museum is located. It is a spectacular museum! I spent about five hours there and felt very rushed through parts of it in order to make my train back to Paris. After visiting Yad Vashem (Holocaust Museum in Jerusalem), which focused on the human suffering side of WWII, just over a week before, it was interesting to learn more about the tactical and historical aspects. I also took a tour of the actual beaches where the Allied Forces landed. Omaha Beach is now a summer resort area, though in March it is pretty desolate subtracting out the Normandy tour groups. I asked the guide what veterans of D-Day thought of kids playing where they witnessed so many of their comrades perish (4,850 GI’s died on D-Day on “Bloody Omaha”). She said that their typical response is that they were fighting for freedom, so they are happy to see families enjoying the rewards of their sacrifices. 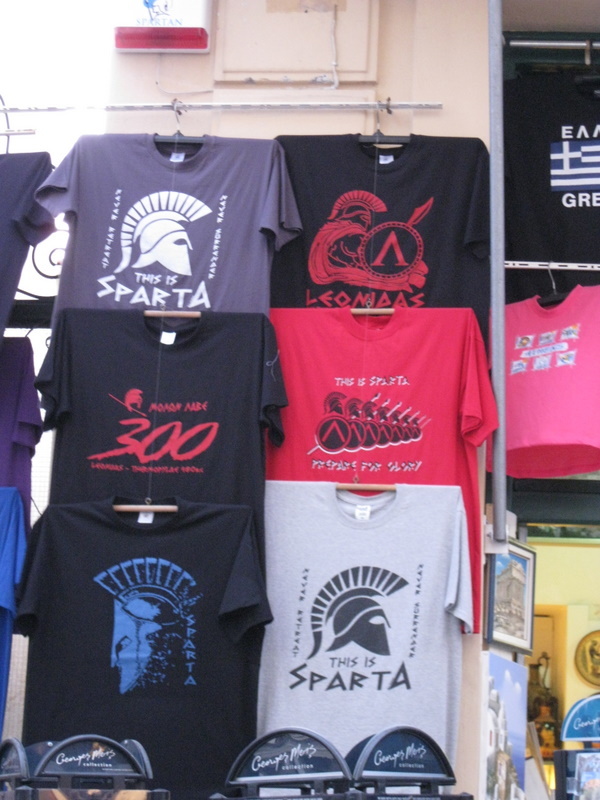 Coming to Athens I expected a lot of Spartan stuff, and of course as a Wolverine this makes me sad. 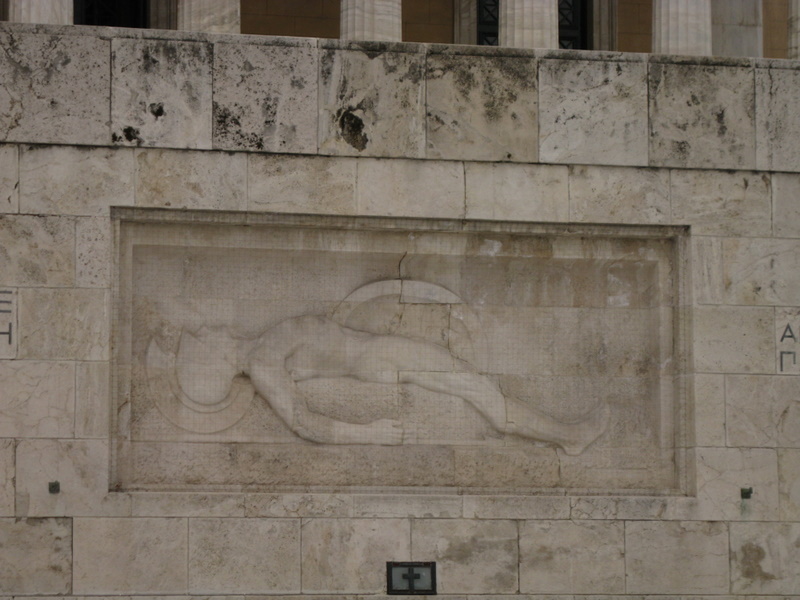 Additionally, I poorly timed this trip to coincide with the sting of the Big Ten Tournament… At least there is a relief sculpture of a fallen Spartan which made me smile. 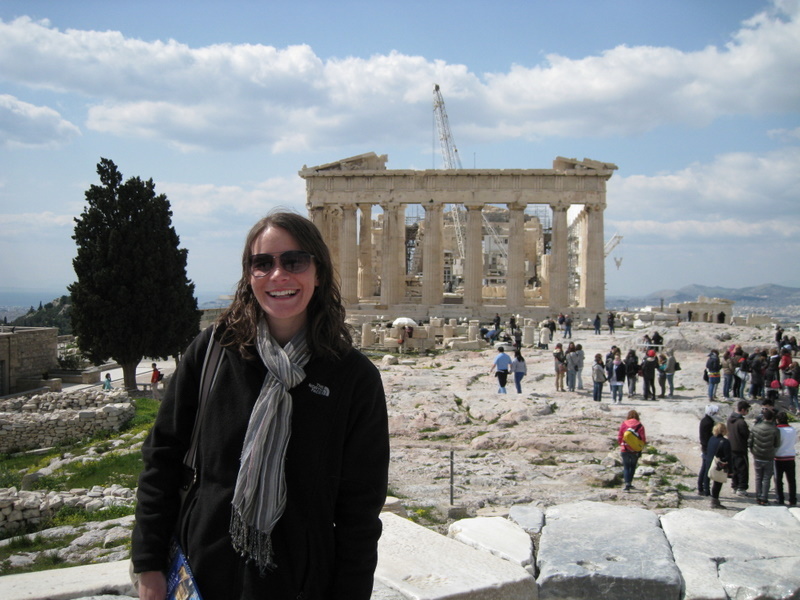 The Erechtheion is in much better condition and is considered the most holy site of the Acropolis. This is where the goddess Athena planted her olive tree. Apparently there was a contest for the naming of the city between Poseidon and Athena. Poseidon struck his trident in the ground and a spring gushed forth. The citizens were not impressed because it was salt water, like the waters of the sea that he ruled. Athena planted a seed in the ground that grew into an olive tree. She won. 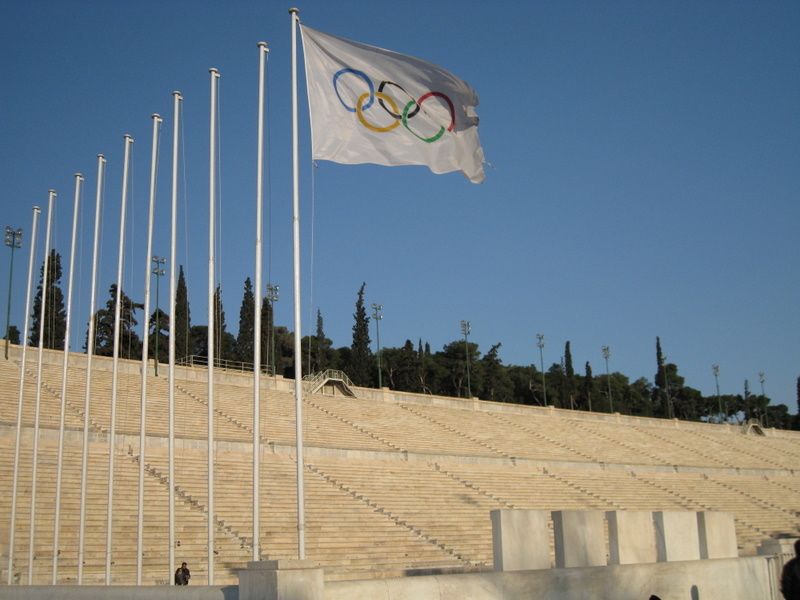 The Temple of Olympian Zeus is basically just columns. Apparently 16 of the original 104 columns have been preserved and sits right next to a tennis club. The nearby Hadrian’s Arch was constructed in 131 AD in honor of the Emperor Hadrian. The arch sits only about 100 feet from a major roadway. It’s weird to be walking down the road and then boom, there is a 2000 year old monument. I think my favorite archeological “find” was a really old looking church (no description) right in the middle of a major shopping street. 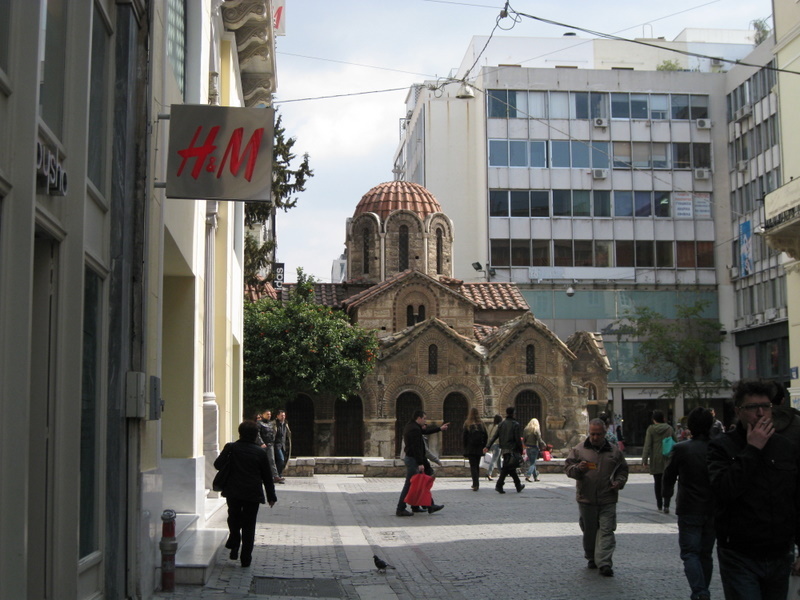 Walking along there is a church, and then right behind it is an H&M. Mom, you will be happy to know that I am no longer allowed into Syria, Iran, Iraq, Lebanon, Libya, Saudia Arabia (even before I wasn’t allowed to take a Saudian Arabian Air flight because it had an 18 hour layover in Riyadh and as a solo female traveler, no male was able to provide “permission” for me to enter…), Sudan, Yemen, and a few other countries you would cringe at the thought of me visiting… Well, I can’t go until I get a new passport. The only reason: because I went to Israel and got my passport stamped. Side note: being in Jerusalem for Shabbat was quite an inconvenience for those of us who forget and didn’t buy enough water and snacks. At about 4pm on Friday literally everything not located in the Muslim section shuts down. Public transportation, stores, restaurants, markets, etc. all close up shop until after sunset on Saturday. There is no traffic and very few people (most likely tourists) are out and about. Its a really eerie feeling. 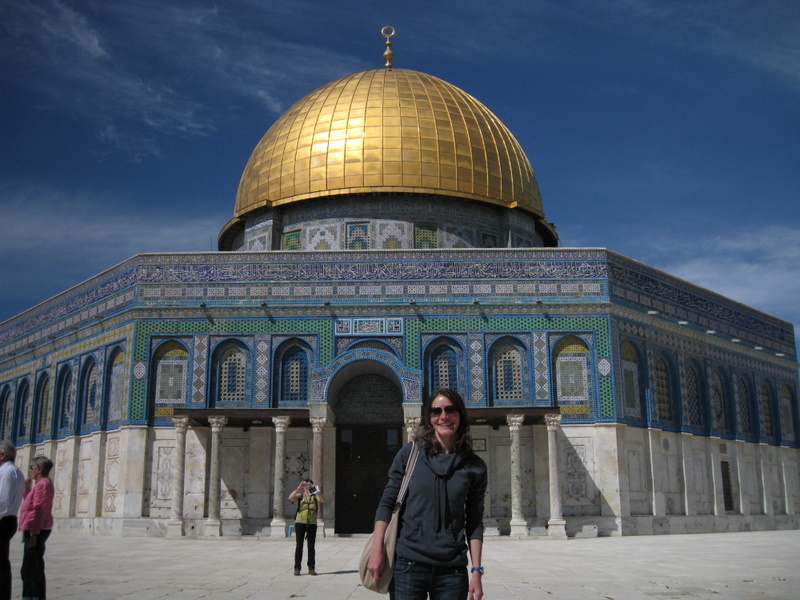 In Israel the most interesting thing I did was to take a political tour of Jerusalem (nerd alert I know). The Palestinian guide spent several hours explaining the Palestinian side of the conflict with Israel, which quite honestly I had no knowledge of. He took us to a refugee camp where we could see the stark contrast between their living conditions and that of the next door Jewish colony (colony is their term for neighborhood). An interesting difference he pointed out was that you can distinguish a Palestinian house by the black water tank on the top of the house used when Israel cuts off their water supply, while the Jewish houses don’t have that necessity. The most astonishing part of the tour was the neighborhood of Sheikh Jarrah, only a ten minute walk from central Jerusalem. From the Palestinian viewpoint, Jewish settlers have come in and forcibly evicted families who had been in these homes for generations. 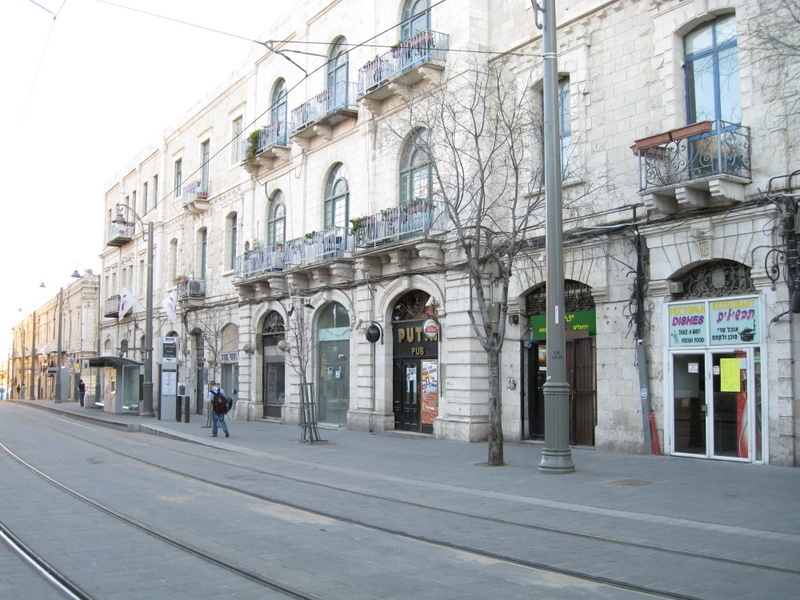 Basically it boils down to a land dispute: the Jews believe the property is theirs because it belonged to Jews in the 19th century, though the Palestinians say that their claims are unsupported. The UN and the United States side with the Palestinians, and yet the Jewish settlers remain in the homes. The Palestinians claim that the Jewish settlers are targeting this area to gain a Jewish demographic majority in East Jerusalem. 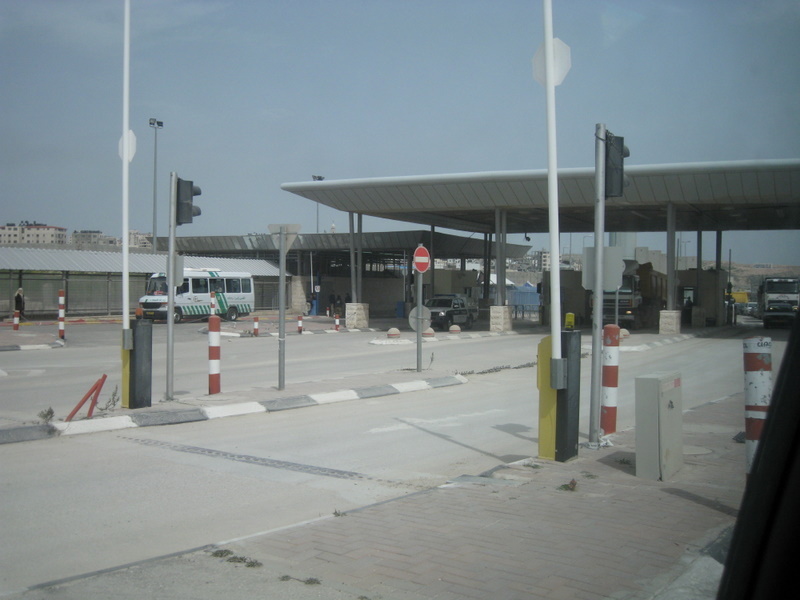 Though I am certainly no expert on either subject; the checkpoints (which look and feel like international borders, which in reality sometimes separate Palestinian side from Palestinian side – essentially just creating a big traffic nuisance), the unreasonable residential restrictions, and the infrastructure projects that are built in the middle of Palestinian neighborhoods to break them apart strongly remind me of the apartheid laws in South Africa. And I know that it sounds like I am some kind of left-winged activist, but it is pretty hard to see the occupation and draw so many parallels to what I saw in South Africa, in which the white minority rule obviously came crashing down in time. The tour was definitely an eye opening experience. Yad Vashem is a very thorough museum chronicling the Jewish suffering during the Holocaust. The stories that the survivors told about their time in concentration camps were literally bone-chilling. The most disturbing video clip I saw was of a Polish-Jewish women who had managed to survive life in a concentration camp and returned to her home. A new family had moved into the vacant house and their greeting to her was “why are you still alive?”. On a more emotionally pleasant day, I traveled south in Israel. I hiked up the snake path in Masada to a fort and some beautiful views of the Dead Sea. Ein Gedi is an oasis in the desert with waterfalls and greenery. Then came the Dead Sea. I had already been on the Jordanian side, so some of the novelty of floating in gelatin-like water had worn off. But I still did the typical float in the water and cover your skin in the mud (which by the way is sold for exorbitant prices in expensive cosmetic stores). You can see how much the sea is receding because of lower rainfall levels in the surrounding watershed. Basically while in Egypt, I don’t think I bought a single thing without having to negotiate or at least worry that I was getting ripped off (other than at trusty McDonalds of course). And I’m not just talking about a scarf in a tourist bazaar; I mean a bottle of water or a roll of toilet paper… It was exhausting. It is common practice to not have any prices listed on anything in grocery and convenience stores and when you (as a tourist) would go up to the counter and ask how much something costs, they would just make up a price. It was up to you to negotiate, walk away, or just accept it. Only in extenuating circumstances would I accept getting ripped off because of my skin color, but depending on my level of frustration, convenience of alternates, and general level of hunger, I did utilize all three during my duration in Egypt. Tourism is down considerably after last February’s revolution that overthrew President Mubarak and the continued violence that makes it into the Western media. Official numbers that I’ve found online in published papers say that its down about 30%, while a guy in my hostel in Cairo claims numbers have dipped by as much as 75%. From my own observations, people stayed out of Cairo, but the rest of Egypt didn’t seem so desolate of tourists. This definitely worked to my advantage on multiple occasions with booking trains, hostels, etc. at the last minute and giving me additional negotiating power (which in Egypt is obviously necessary). 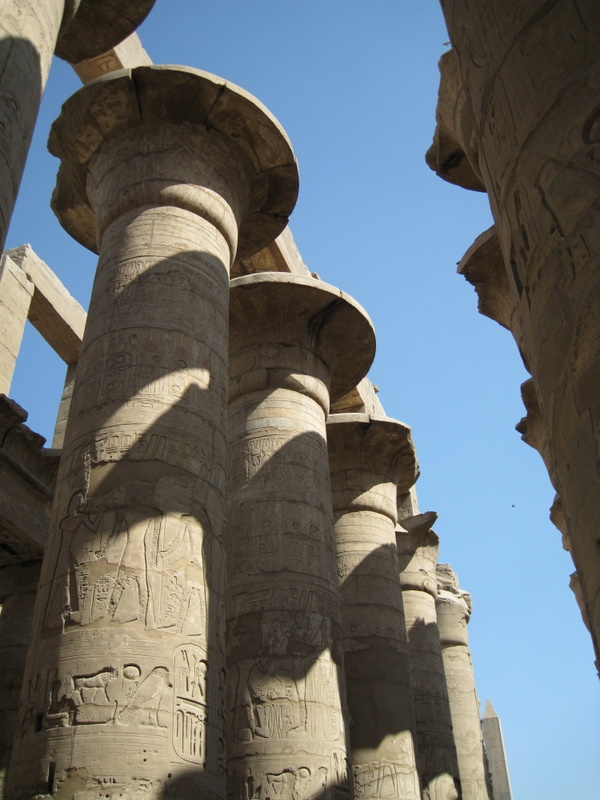 Overall, I will call my Egypt experience one of “character building”. After flying from Luxor to Sharm El Sheikh (and of course sleeping in the Cairo airport since I didn’t book a more costly direct flight…) I had to figure out how to get from Sharm to Dahab which is about an hour away. Usually there is a bus that runs every hour and should have been an easy trip. However, the buses were on strike. I only found this out by having the taxi driver take me to the bus station to be sure that he wasn’t simply trying to rip me off for a more expensive fare. Well, it turns out he was actually telling me the truth (or took me to a different, but very convincing closed bus station…). In true backpacker fashion obviously not wanting to have to pay the full way by myself I found a local Egyptian guy that is also going to Dahab and offer to share the ride. The taxi driver quoted 150 Egyptian pounds (about $25), which is a good price according to wikitravel, so splitting it with this guy would be a decent way to go. I clarified that in fact we would be splitting it 50-50, each paying 75 pounds. His response I kid you not: “well, I’m not a tourist so I only want to pay 20”. I was supposed to pay 130 because of my passport, and he thought that that was completely reasonable. Never mind the fact that I’m taking minibuses like the locals do, not taking the chartered air-conditioned buses around like a lot of the tourists. I obviously turn that down and say that I’ll wait around for more people to bring the cost to a more reasonable level. Either the driver or the local guy got tired of waiting after about 20 minutes so they say fine, 75-75 and we leave. I’m sure the local guy didn’t really pay that much, but either way I got the ride for the price I was willing to pay after a bit of frustration. Unfortunately I had been pretty congested for over a week from the pollution and all of the second hand cigarette smoke, so unfortunately I wasn’t able to go scuba diving. I was pretty bummed, but decided to try and make the most of the Red Sea and go snorkeling. I was not disappointed! The coral and wildlife I saw was as good as, and maybe even better than the Great Barrier Reef, which is obviously a tough feat. And there were divers underneath me, seeing the same stuff, but at about ten times the price I paid, so bonus! Mt. 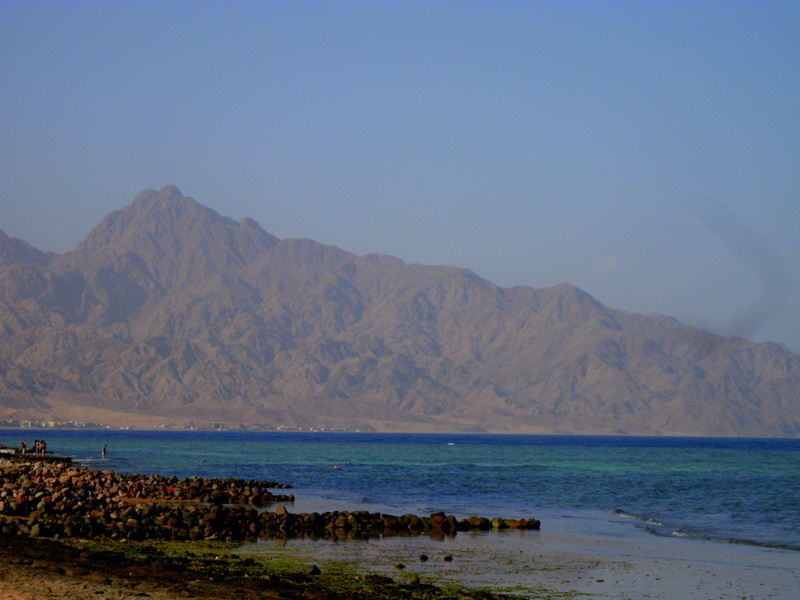 Sinai, where Moses delivered the Ten Commandments is a popular trip from Dahab. So of course I had to do the difficult (but popular) version and climb the mountain to see sunrise. I left my hotel around 11pm and got to the starting point on the mountain about 1:30am. Well, this was after driving through the snow storm, not joking unfortunately. I started climbing with my group and Bedouin guide in complete darkness. I had been warned about how cold it is during this journey and dressed appropriately in a full suit of Under Armour underneath two fleeces and a rain jacket; in total I had six layers on the top and two on my legs, along with hat, gloves, and two pairs of socks. 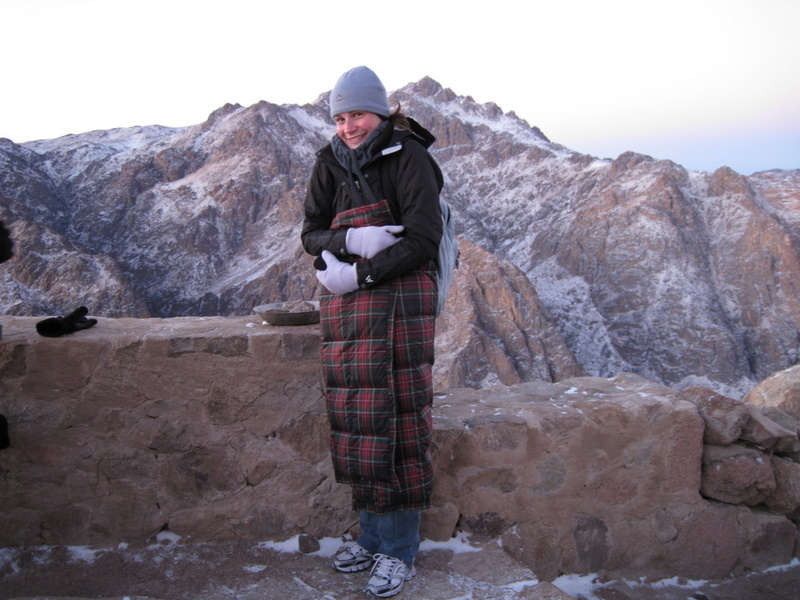 I actually got quite warm while climbing, however because my group was apparently quite adept trekkers, we moved too quickly and had to wait in a Bedouin house (without heat of course) for almost two hours to wait for the sunrise. Regrettably, during this time, just sitting around in sub-zero temperatures, I got quite cold, even with a down blanket, and never quite recovered. I got to see the sunrise over Mt. Sinai, which was a very cool site to see, but unfortunately between the wind and my shaking hands, very few of my pictures turned out very well. I even downloaded a picture of the Ten Commandments on my kindle and was hoping to re-enact the Moses scene, but I couldn’t feel my hands enough to even turn it on. 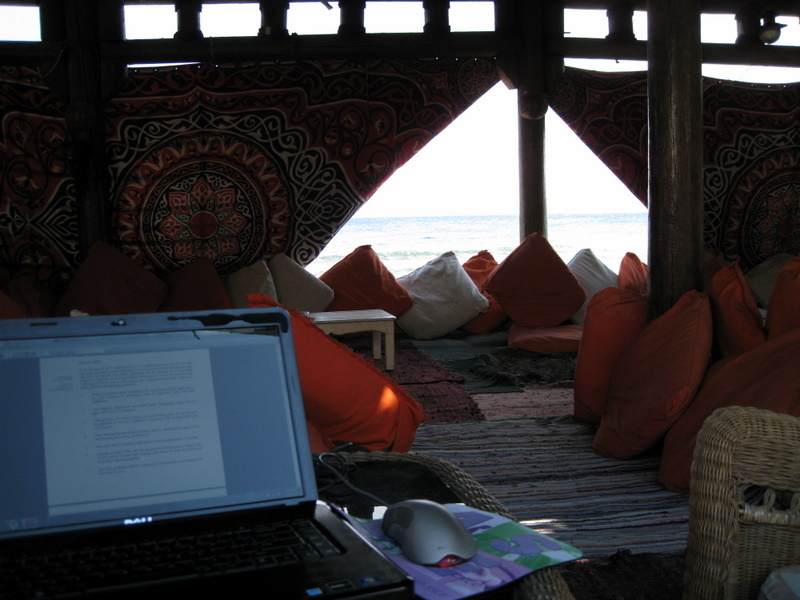 I stayed in Dahab for a fairly extended period of time because it was a good place to get some work done. My hotel had a beach-side restaurant that had quite a view, which I used as my “office” for the week J And bonus since I’m not volunteering at the Humane Society anymore, I got my fix of kittens! A mom had had a litter of five kittens on the upper deck of the restaurant a month ago and all of the kittens were quite friendly! It probably didn’t hurt that I fed them and the mom, usually two meals a day… It was ironic to watch them beg for table food and for me to give in, since my cat at home is not supposed to get any people food, despite his “Puss In Boots eyes”… (Lisa this is directed at you). 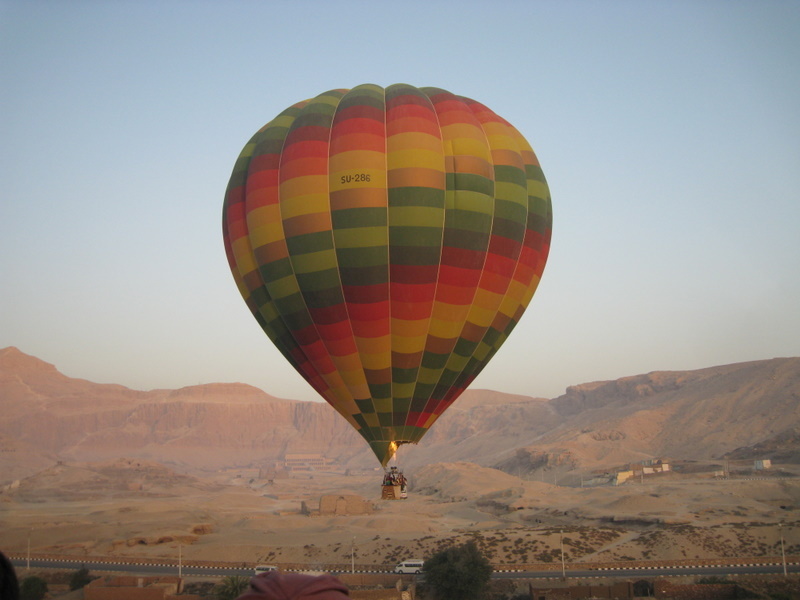 The “thing” to do in Luxor is take a hot air balloon ride over the West Bank (which includes the famous Valley of the Kings), so I felt obliged to take part. It was worth it; seeing the sunrise over the Nile from the balloon was pretty cool. I also saw a few temples and some other cool things which I can’t identify… Word of warning to anyone who goes on a balloon ride in the future, wear a hat. When they fire up the balloon, which happens throughout the entire ride, you are only a few feet away from a burst of fire and it gets VERY hot. There were a couple of times I needed to double check that my hair hadn’t been singed. From Alexandria I needed to find a way to get to Aswan, which is about 675 miles away. I decided to take the only direct train (which is for locals, tourists are supposed to take the sleeper class ones that originate in Cairo and cost three times more, but provide a bed). I have slept in chairs on overnight trains before without an issue and assumed that buying a seat in first class would keep the riff-raff out and afford me at least a half-way decent nights sleep. I can’t count the number of times that I have misjudged my ability to handle “local” things on this trip, but this certainly adds another. Apparently in my old age I require more luxury than the cheapest options offer: though I really should have expected problems with a train ride / night of accommodation for $23… For starters, EVERYONE in Egypt smokes. And not just a little, but relentlessly. So even though they were “kind” enough not to smoke in the actual carriages, only in the small connection areas between the train compartments, the ventilation holes in the walls allowed me the great privilege of total immersion in cigarette smoke. The other problem was that the train made so many stops that there were constantly people coming on and off the train and unfortunately for those who buy tickets, the conductors don’t often check them, so I’m guessing there were quite a few people risking the fines… And what first class train doesn’t have power points? My kindle died halfway through, so I had very little to do for the second half of the journey. Oh, and did I mention that this was an 18 hour train ride?!?! Nevertheless, I arrived in Aswan, not a super happy camper, but in one (very smelly) piece. And it seemed my luck had changed. The draw for going to Aswan is that it is the jumping off point for Abu Simbel – the temple that Ramses built to commemorate himself and his queen, Nefertari. 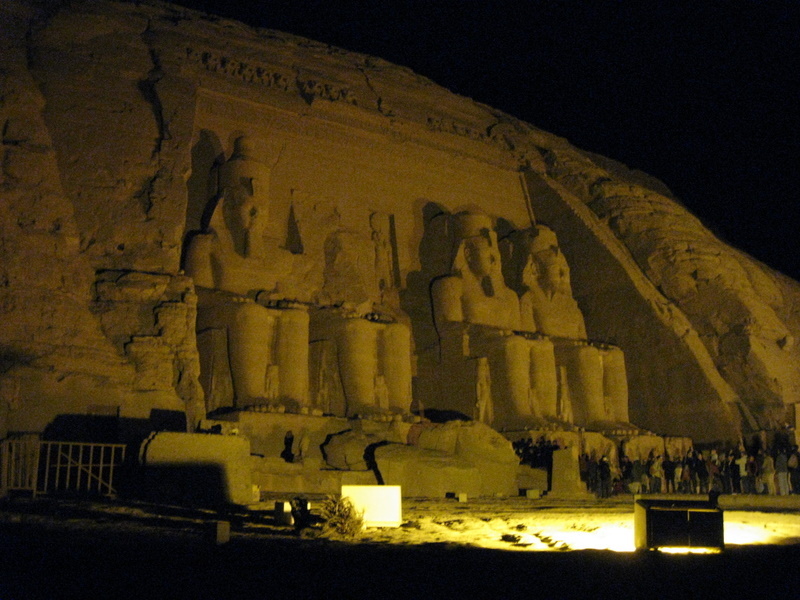 The Abu Simbel Festival only happens twice a year; once on February 22 (the date of Ramses’ ascension to the throne) and on October 22 (his birthday). Abu Simbel was architecturally designed so that the inner sanctum would only light up twice a year (those two days), which would obviously be cool to see and most likely pretty popular. So I was nervous showing up the day before that minibuses in the convoy from Aswan to Abu Simbel would be full, but the lack of tourism in Egypt right now definitely helped me out and I got a seat. However, it’s a three hour drive from Aswan, and the event takes place at sunrise… So I got picked up from my hotel at midnight. The Egyptian Government mandates that all travel between Aswan and Abu Simbel must be done in a police convoy. So the convoy left at 1am on our journey. What I can’t understand is how a line of dozens of buses passing through on a specific schedule would make terrorist attacks more difficult… But that’s the way it works and I arrived at 4am, in complete darkness. There was already a line forming at the main temple of Ramses, so I join. And then proceed to wait for nearly two hours for the sun to come up. No one had any idea what was going on, or even what the “light” was going to be and none of the armed guards offered any explanations. So finally at about 6:05am everyone gets shoved to the side of the entrance and then shoved into the temple like cattle. You weave through the outer columns and then pass the inner sanctum (basically just a statue at the back of the temple) before getting literally pushed out the exit. Unfortunately because they were rushing everyone through so quickly before the sun rose further and the effect was gone, I only got a brief look, but at least I did see it, even if I don’t have decent photographic proof. 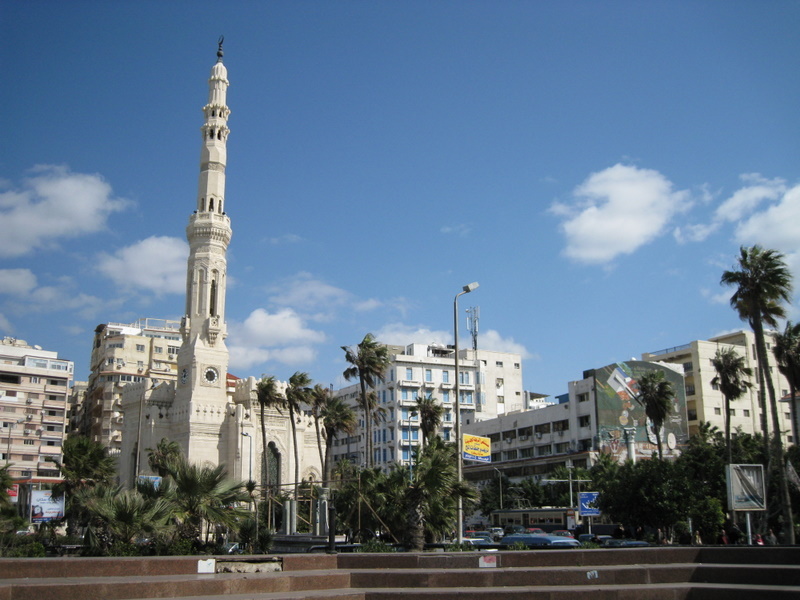 Alexandria offers all of the benefits of Cairo: cheap accommodation and food, without sacrificing on western amenities (and by this I of course mean internet and western toilets). But Alex also has several added benefits, which made it a very pleasant stop despite the colder temperatures (only about 55 for a high). After India and then Cairo (where there is also horrible pollution with the added attraction of EVERYONE smoking, even in the hostel…) I have not breathed a breath of fresh air in a long time, so the breeze from the Mediterranean is quite a nice change of pace. Another major benefit I see to port cities, other than their inherently pretty coastlines, is that getting un-lost is infinitely easier when there is a massive, immovable body – such as an ocean – helping to navigate me to the correct location. Secondly, the traffic situation in Alex is significantly less death-defying, the simple addition of a few traffic lights does wonders for both congestion and pedestrians. And there are actually cool buildings to look at and mini parks scattered throughout the city of 4.1 million people, unlike the massive, concrete and falling down buildings landscape that much of Cairo offers. 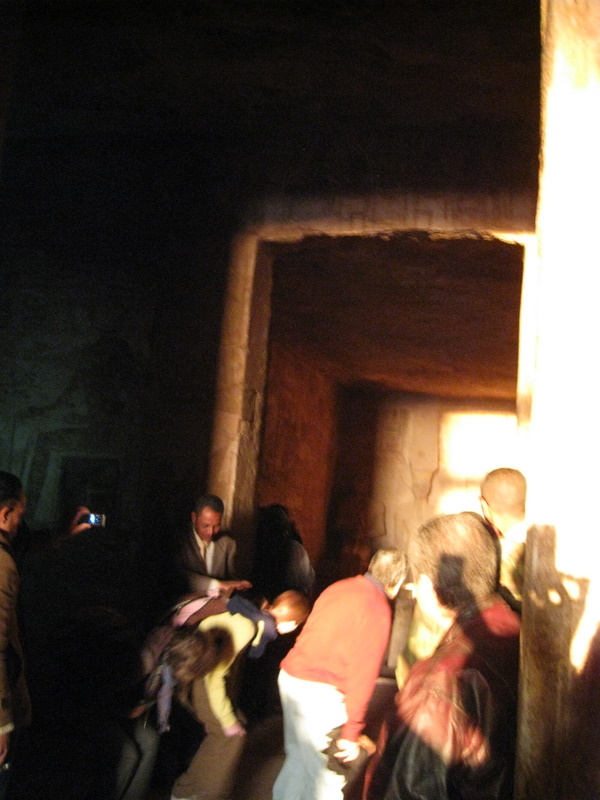 I also ventured to the Kom el-Shuqafa Catacombs. Kinda creepy. They are basically an underground labyrinth that was used to bury people. The site over one square kilometer in size (247 acres) and was only discovered when a donkey accidently fell through. There are several different sections, but probably the most chilling is a room that looks like a bunch of lockers, but lockers for bodies… They also have a display case of bones that they recovered. Needless to say, it was interesting, but apparently I have been to too many haunted houses in my day and half expected someone to pop out at any moment, so I didn’t linger very long. 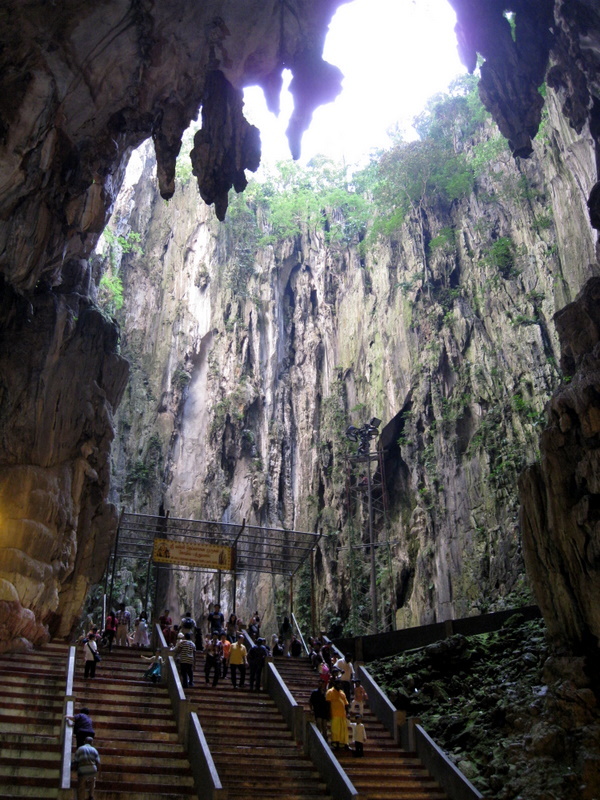 (They confiscated my camera at the entrance, so I stole this photo from google). The first piece of advice that several random people gave me while walking down the streets of Cairo: “you know how to cross the road, right? Close your eyes and pray”. Well, I can see where they are coming from. Despite the fact that my hostel was only about a five minute walk from Tahrir Square, the infamous site of the Egyptian Revolution that took place just about one year ago, quite literally crossing the street is the most dangerous thing I encountered, though it was truly a scary endeavor. The whole process of crossing the street became a real-life game of Pac-man, the key was finding a local (preferably one bigger than me) and latching on. I did mistakenly stumble upon an anti-Israel rally of about 20 people, but when I realized what it was I promptly got out of there not wanting to be mistaken for an Israeli. Tahrir Square has basically just become a tent city with a make-shift street market set up; I could have had a shoe-shine, bought pantyhose, or sat down and had a cup of tea if I felt so inclined… This is in the midst of the massive damage that the protesters caused last year in their successful attempt to oust President Mubarak. 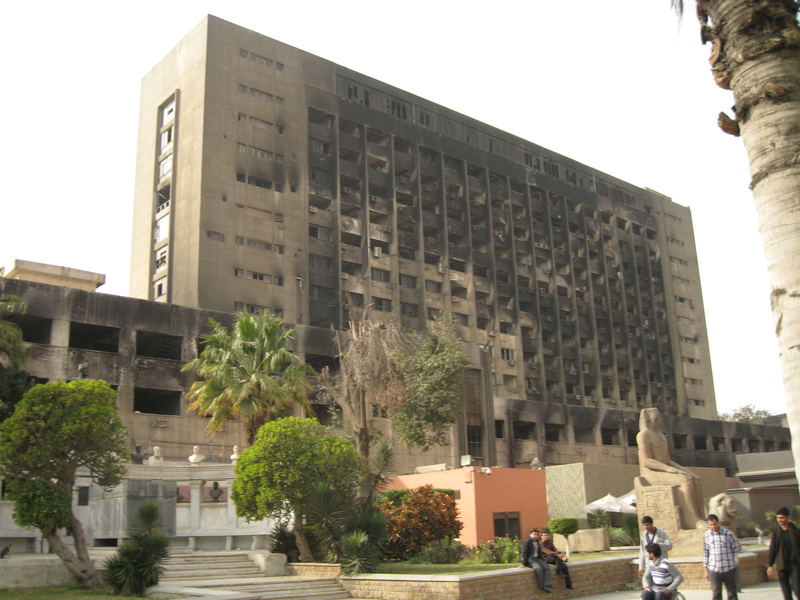 For reasons I can’t begin to fathom, they trashed a McDonalds, oh yea, and completely torched a government building right next to the famed Egyptian Museum. The Egyptian Museum was disappointing to say the least. As a world-famous museum holding amazing artifacts, it does an absolutely horrible job with the presentation. There were very few placards with explanations (even in Arabic), so basically visitors are left to wander aimlessly through the museum looking at mummies, the clay pots holding the visceral organs (lungs, stomach, liver, and intestines) removed during the mummification process (I looked this up after), and other random paintings/scuptures/artifacts. 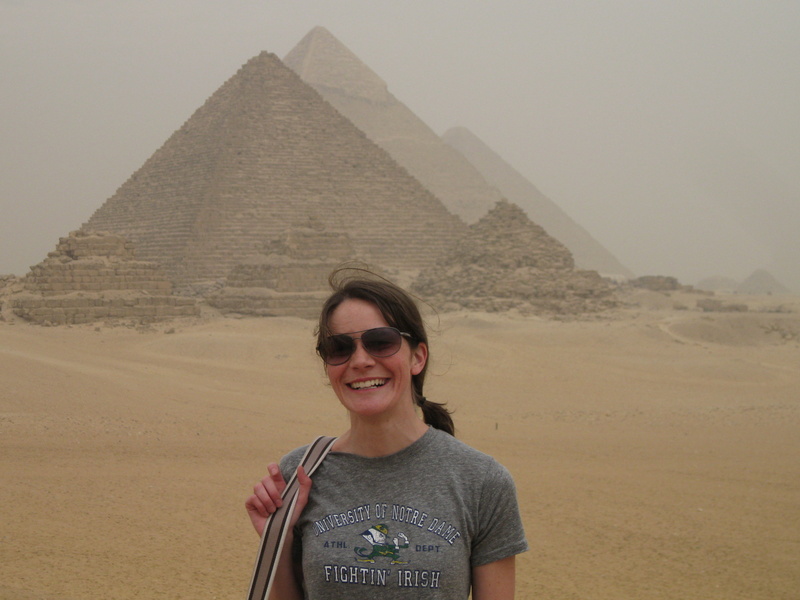 Hiring a guide might have been more informative, but after my experience at the pyramids, I was not interested in being ripped off again by a guide who knows less than a Lonely Planet guidebook, and mistakenly thought that there would be the poster boards explaining everything. 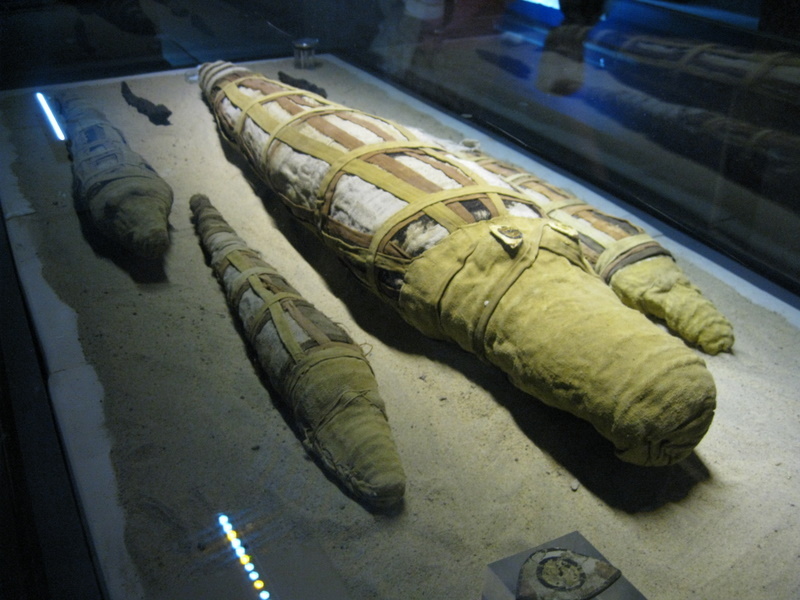 The best part was the gold masks and coffins of King Tutankhamen. From the research I’ve done, he is really only famous because the archeologists who uncovered him did a really good job with preservation. His short nine year reign, ending at the age of 19, really doesn’t have much to do with the fact that everyone has learned about him in elementary school. And now for my gastronomical escapades: after basically starving in India for both the fear and the reality of getting sick, my body went into survival mode I think. I basically have not stopped eating in over a week. I eat a full meal, and an hour later I am not just hungry, but I feel famished. My guess is that I’ve been consuming over 5000 calories a day, so it’s a good thing that Cairo offered a variety of cheap food. They of course have McDonalds, which was the first meal I ate when I got in. I don’t think a Big Mac has ever tasted so good after being deprived of meat in India for two weeks. They also have a McArabia sandwich, which is a gyro: I obviously have to try the “local foods”… I became quite fond of the Egyptian equivalent to fast food with a restaurant called “Gad”. They have a variety of beef and chicken shawarma sandwiches as well as falafels, which I have grown quite fond of. These sandwiches are quite tasty and at only about $1, they are quite a great deal! I also discovered an amazing bakery. The cookies, pastries, cakes, and gelato also added to my weight-gaining diet, and they all tasted fantastic! This is basically just venting… So read at your own peril. So I get to the airport, after only paying the original fare, and am not allowed in the door. I didn’t have a printout of my ticket or a PNR number (whatever that is) and they didn’t accept my confirmation email on my kindle, so I wasn’t allowed to enter any part of the airport. Some guy disappeared with my passport for 15 minutes before he finally came back after going to the ticket counter to verify that in fact I didn’t just show up at the airport as some tourist attraction… I proceed to the Oman Air desk and hand over my passport, and what a surprise, I’m actually booked on a flight and they didn’t have any purpose for some printout. I think the lady felt sorry for me, so I got upgraded to business class. I had platinum status on American Airlines for nearly two years and never once got upgraded; I love middle eastern airlines! After checking in for my flight, I am directed to the departure form desk. I wait in line for at least ten minutes to have some guy fill out an immigration form containing only the basic information including name, passport, and flight numbers. Something I could have filled out in 45 seconds, someone got paid to do. I advance to the immigration desk and of course have to join a long line. I am waiting for about ten minutes and am second in line when the officer stands up, counts his forms, apparently decides he has met his quota and simply walks off without explanation, leaving me and the probably eight people behind me scrambling to join another line. 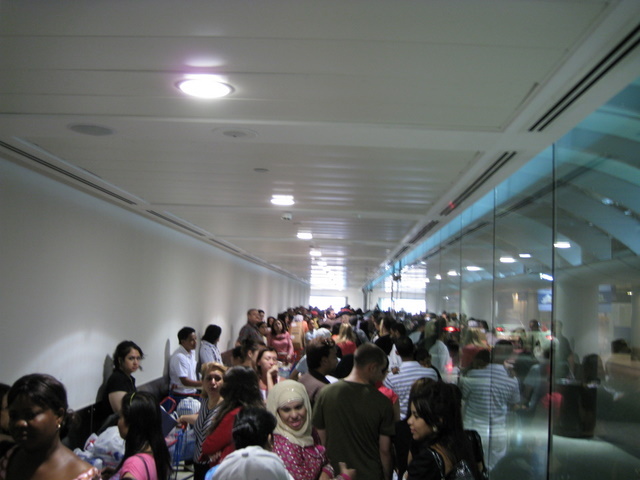 After finally making it through immigration I move to the security check point. A lone bright spot of the Indian airport experience was not having to remove my shoes. I proceeded to be frisked quite aggressively by hand. I have no idea why anyone in the US complains about the new security scanners in the US, standing in a chamber for five seconds is far better than being groped to the extent that a lone ten rupee note in my back pocket was felt and subsequently removed. After I received my three stamps on my boarding pass signaling that I had successfully completed the security check, I was allowed into the boarding room. Luckily the flight goes off without a hitch and I arrive in Muscat to an amazing airport full of western facilities! I had basically gone vegetarian while in India, despite my body’s craving for meat (in my unsuccessful attempt to avoid food poisoning after seeing meat being chopped on tree stumps). [My beloved, failsafe McDonald’s even caused problems. And by the way, if you have heard the rumor that McDonalds in India serves ham burgers, like ham on a bun – not beef, it’s not true – no beef or pork, just a couple varieties of chicken.] So when I saw a Subway in the airport, I was in heaven. I think I paid about $12 for a 6-inch sub that included ham, turkey, and “beef strips” (bacon), and finally my stomach lessened its attacks on me. Most of the reason for such low costs is the extremely low cost of labor in India. I’m sure that part of this stems from the fact that there are just too many people in a small area. According to Wikipedia, there are 1.2 billion people living in India, while there are (only) 1.3 billion in China, which obviously encompasses a much larger land mass. Because of this competition for jobs, whether it be rickshaw drivers, shop owners, etc. they can get extremely pushy. Being a solo white female traveler I have to assume that I was more of a target than average, but let me assure you that I bargain and negotiate with the best of them. Negotiating or simply walking away from rickshaw drivers that were trying to take advantage of me, probably only saved me about $15 or $20 in the end, but it’s not about the money, it’s about a sense of not being ripped off and taken as a stupid tourist. The bureaucracy in India is astounding. I have read articles in my dorky business magazines about the notorious red tape associated with India. One of the most widely used statistics is the number of procedures it takes to start a business. In Singapore, that number is 3 which can generally be accomplished in 3 days and costs a mere 0.7% of per capita income. One the other hand, in India it takes 12 procedures, an average of 29 days, and costs a whooping 47% of per capita income to do the same thing. I travelled from Singapore, one of the most business friendly countries to India, one of the least. Is there possibly a connection to business friendliness and general wealth/ standard of living perhaps???? Sarcasm? Another consequence of massive government involvement is that they control the power supply. Even though private enterprise has built many power plants, the other parts of the supply chain are government controlled, and the public sector is not doing a good job. 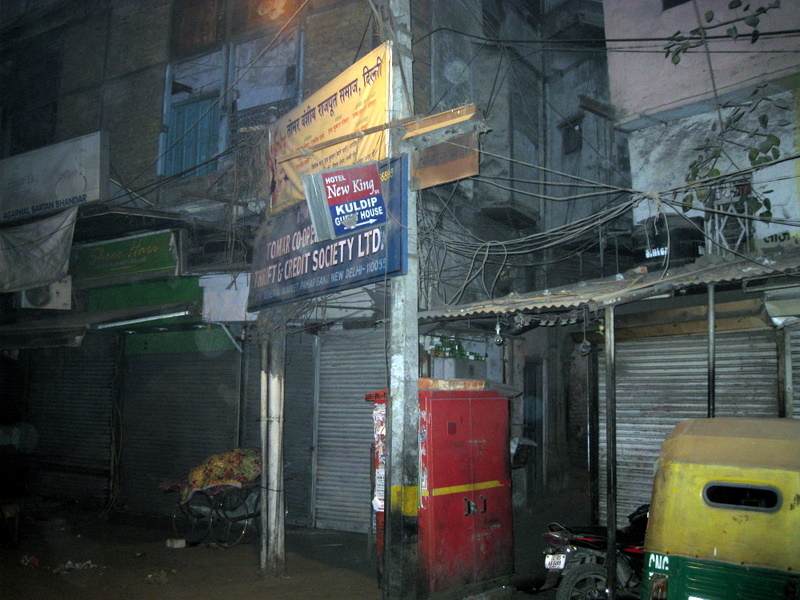 Power outages are the expected norm in India. You can always tell the tourists who just arrived in India because when the power unexpectedly goes out, they go and yell at the front desk. There isn’t anything the hotel can do, other than get a generator (which some have), all just part of the “experience of India” I guess. My personal opinion on the matter, but maybe the government should eliminate some of its excess paperwork and maybe concentrate some man-power on garbage collection and disposal. You are very hard pressed to find garbage cans anywhere, on the streets or even in buildings. I’m not sure if that’s because the culture dictates that you just throw everything on the ground and people wouldn’t use them, or if people are forced to haphazardly discard refuse because they’re not available. Chicken or the egg I guess. But either way, the garbage situation is appalling. I watched a little kid at his mothers suggestion just throw his water bottle out the train window to fall where it may. And its quite obvious that the entire population takes the same approach, as there are literally mounds of garbage on the sides of roads. Some shop owners actually try to clean up their section of the street by sweeping the garbage up around them. Awesome first step, but then they make a pile and burn it creating a further problem with pollution. 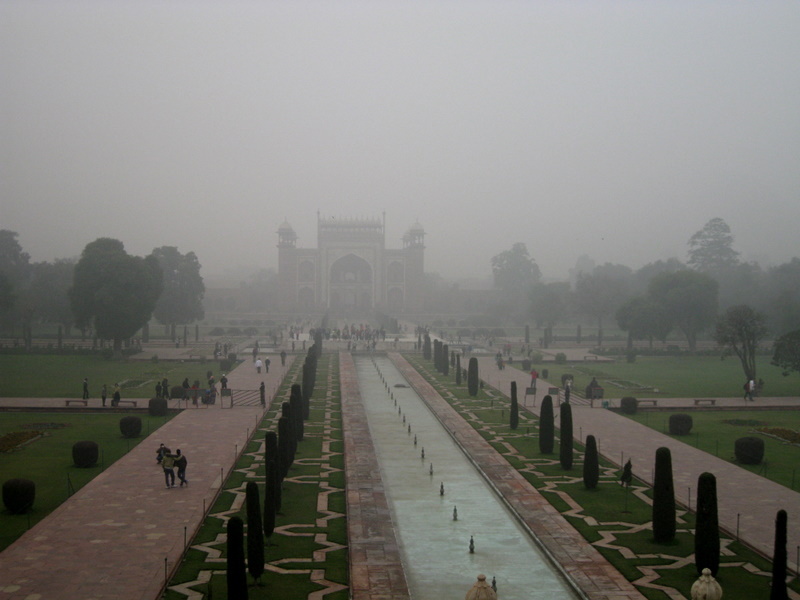 I arrived in Delhi at the airport and had arranged for a private driver to pick me up. For the convenience of not having to deal with touts, I paid the steep price of about $10 USD for the half hour journey into the city (metro would have cost less than a dollar). I nearly died in that taxi. The drivers in India are crazy to put it mildly. Cars, rickshaws, motorcycles, bikes, and cows all share the road and of course no one is patient or uses the lanes. They drive wherever there is an opening honking basically continuously. It’s a terrifying experience and my first introduction to what I’ve gotten myself into entering this crazy, chaotic country. I get to the hotel that had received decent ratings on the booking website. Clearly those statistics were being manipulated by the owners. It’s very scary and dirty for so many reasons (see pic to left)… The owner immediately jumps at the opportunity to make some commissions for himself or his friends when I (so stupidly) say that I don’t have trains to get around the rest of the country booked yet. He claims that its too hard for me to book anything myself online and I must use his cousin because he’ll “give me a good deal”. Thinking possibly it would be easier to just pay someone a small fee to do everything for me, I go to the travel agency and hear the guy out. Instead of just giving me prices for trains, he goes through a whole story about how much better and safer it is to hire a private driver. I tell him that I have no interest in paying for that, especially after my experience in the taxi from the airport, politely at the first one. I had hired a private rickshaw driver to take me around Delhi to see the main sites because its huge and my preferred method of walking wasn’t an option. But the rickshaw driver left me no choice to go to multiple of these agencies that all had the same sales pitch. It reminded me of time-share presentations… By the fourth one I was no longer polite to the travel agent or the rickshaw driver who insisted on dropping me off at these places. I went to my hotel and booked everything online without any trouble on my own using third party websites and paying less than 40 cent commission for each train ride. And then I got sick… On day seven of my illness I bravely ventured out to the Taj Mahal because that is something that I obviously couldn’t skip. It was really pretty, as expected. It was highly suggested to get up early and go when the gates open at 7am to avoid the masses of tour groups that emerge about two hours later. What they fail to mention is that while you avoid the crowds, you also deal with the combination of fog and pollution that hasn’t cleared that early. I think the weirdest part of that whole visit though was an Indian guy asking me to take a picture with him while shaking hands. Is this some famous picture he was trying to recreate?? 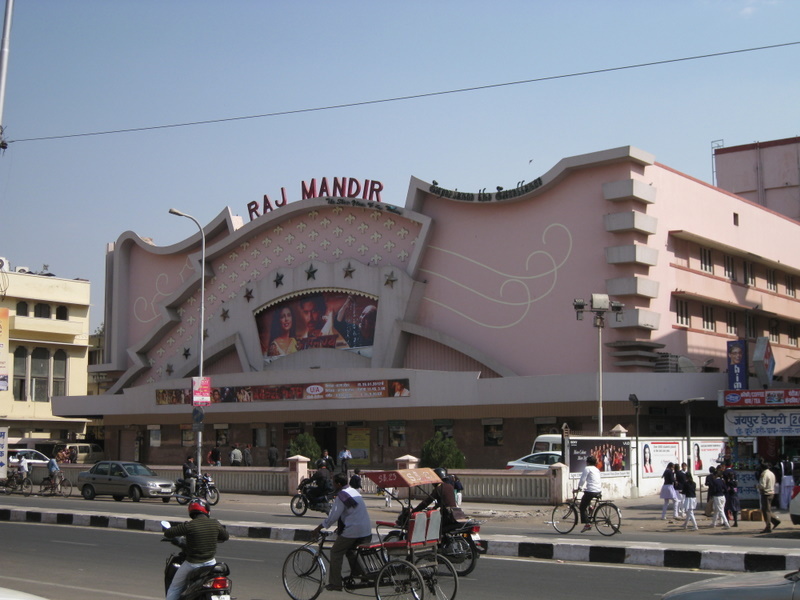 Finally, on day eight I felt much closer to normal and was able to make my train to Jaipur. The train system in India is pretty much the only infrastructure that works reliably in India, leftover from British rule. (Other public works projects don’t usually function properly, roads, electricity, internet, and even water service goes out on a regular basis). Trains are cheap, even in the luxury classes. Despite the warnings that Indian train stations are a daunting challenge for even seasoned travelers, once you wait for the departure boards to switch to English (from Hindi which is obviously unreadable for me), they function the same as in Europe or Asia, though as expected are much dirtier and more crowded. I didn’t see anyone hanging off the sides or on top of trains. For an extra $5, I booked higher class tickets to lessen the chance that my luggage would go missing. One of my trains was delayed by four hours, so I bought a “general” ticket for the train leaving immediately and mixed with the locals for that two hour train ride. A much more interesting experience than the A/C classes… Two transvestites came through trying to drum up prostitution business, or at least that’s what I gathered; no one around me spoke English to explain it to me. I left Southeast Asia earlier than I had planned. I hesitated booking a scuba diving trip to the island of Sipadan (supposedly one of the best places to dive on earth) and then the flights to get to and from dramatically increased. And if I want the fancy-pants apartment overlooking Touchdown Jesus next year, sacrifices have to be made somewhere. So anyway, I was off to India. 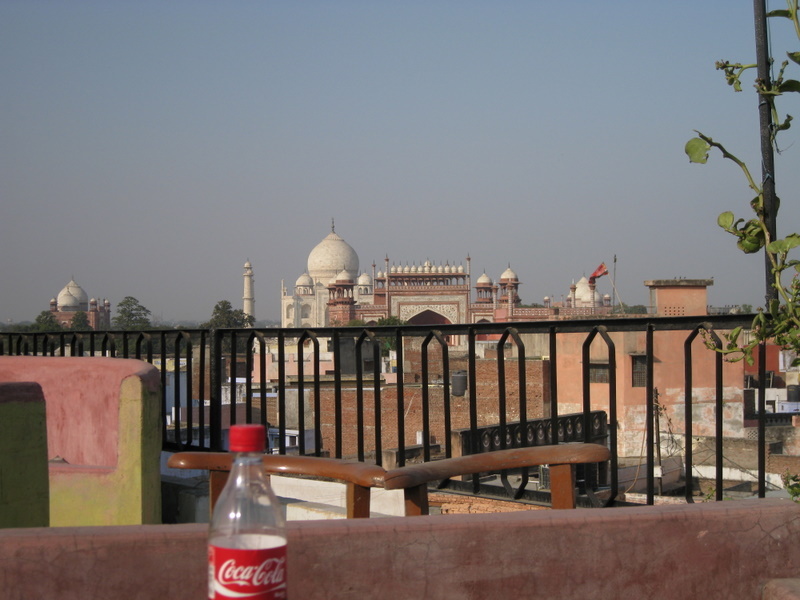 I had talked to several people who had been to India and done some research about it, so I thought I was prepared for the poverty and general grunginess factor. Afterall, I have been to Eastern Africa and some pretty poor countries in Southeast Asia… I wasn’t at all prepared; India is on a whole other level. The city-state of Singapore is made up of approximately 74% Chinese, so missing the Chinese New Year (in the year of the dragon, no less) by a couple of days was similar to showing up in Times Square on January 1 (I stayed in Chinatown in KL and was expecting something to be going on, but nothing interesting did). But alas, there were a few remnants of the festivities. Meandering through an outdoor market I hear a loud drum beating and of course had to go check it out. I wander over to the raucous scene to find a chorus of drums and a Chinese lion undulating through the crowd (to be clear, a person in a lion costume). The lion then lies on the ground for about 5 minutes, but the crowd (all Chinese), stays, so I follow suit. 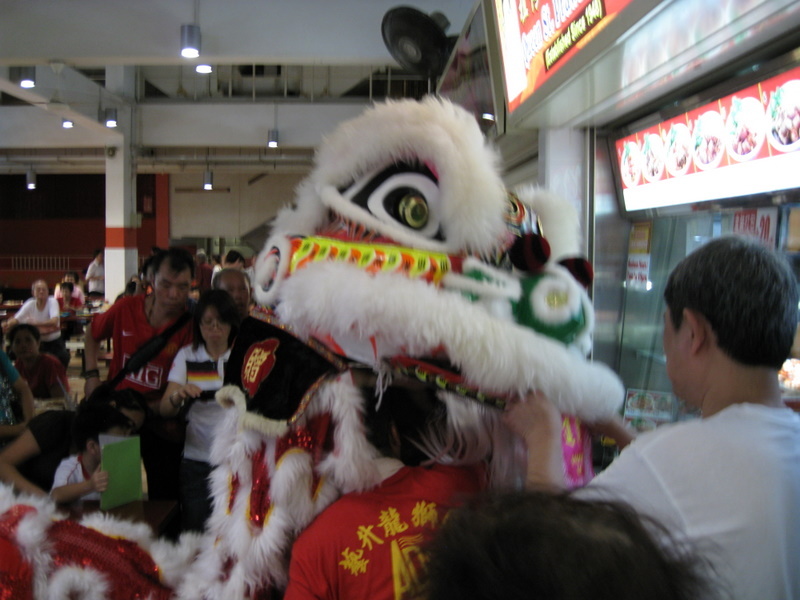 The lion then stands back up with a tray of peeled oranges; I felt like I was at an elementary school soccer game… Apparently he was on peeling oranges while on the ground and then presented the offering as a sign of happiness and prosperity in the coming year. These lion dances are believed to drive away ill-fortune and evil spirits, so now by witnessing this all will go well with my travels (directed at you, Mom). The “fish spa” was an interesting experience. 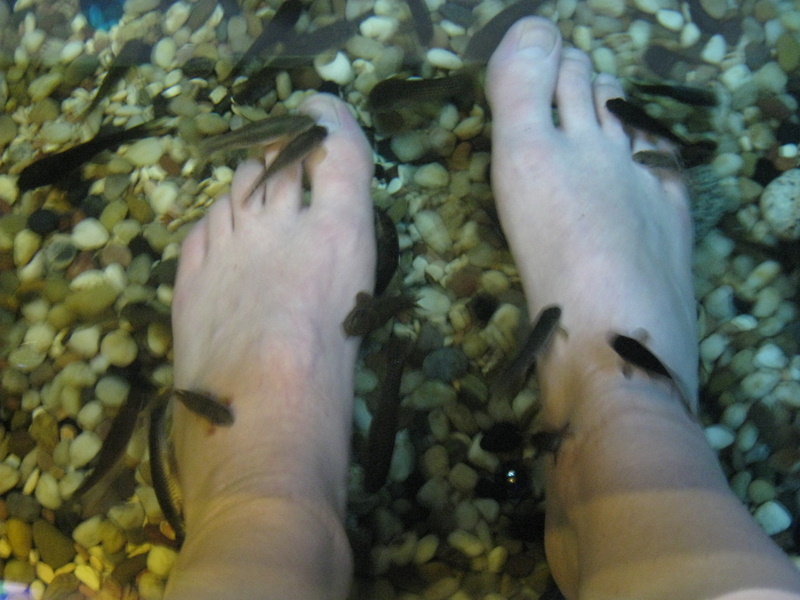 For anyone that knows me and both my hatred of feet and my allergy to seafood this was a big act of bravery for me to do this… The idea behind the fish “pedicure” is that you stick your feet in a tank of fish and have them bite off the dead skin. I won’t eat fish and hate having people touch my feet, but for a once-in-a-lifetime thing, I let fish feast on my feet. I saw it on the Travel Channel Show “Dhani Tackles the Globe”, so I had to try it, even if it was only for 15 minutes. After cleaning my both feet, I put them in the tank of fish and immediately the little (probably about an inch or two long) buggers came right up and started munching. It tickled, a lot. They also had a little tray for your hands, so I could see up close what these things looked like. Their mouth area looked similar to the snail mouths that you get to clean the sides of fish tanks, kinda creepy to realize they were attacking my skin. I don’t think they really did what they were advertised to do, and it most likely was just a tourist trap, but oh well, I experienced my first (and probably last) pedicure. 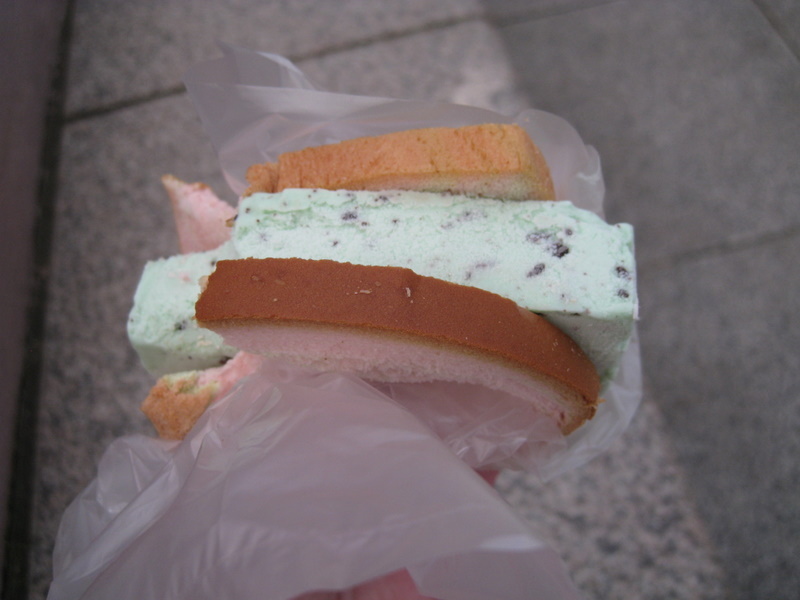 There was an episode of the Amazing Race where the teams had to sell blocks of ice cream wrapped in bread. I ate one of these literal ice cream sandwiches, not as bad as I was expecting it to taste. Seoul was about 15 degrees on my last day there, so meandering around in only two fleeces and a raincoat (I elected to not pack a down coat for only a few days of extreme cold), I was freezing. 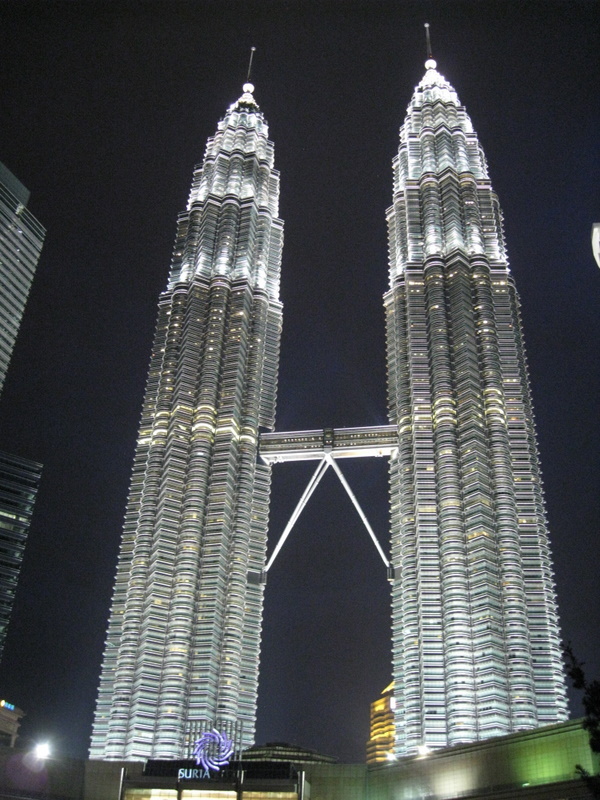 Hopped on a six hour flight to Kuala Lumpur and was greeted with temperatures in the mid-nineties with VERY high humidity. Needless to say, I thawed out quite quickly. Malaysia is an Islamic country. 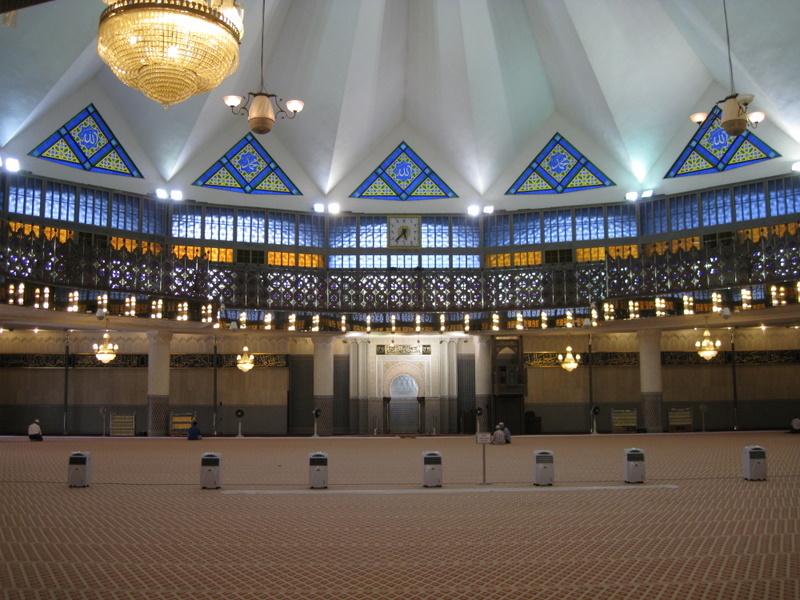 I have been to other Muslim countries before, so it wasn’t too much of a culture shock. However, that does translate into having to dress more conservatively than elsewhere in such extreme heat. Not that I have any problems whatsoever with covering up, but wearing pants and having my shoulders covered in heat indexes of low 100’s and walking around all day is quite hot (luckily ice cream cones were only 30 cents!). Though a lot of other western girls choose not to follow local customs, I feel it is disrespectful to be wearing short-shorts and tube tops amongst burkas, but we all must make our own choices… Anyway, I went to the National Mosque, and non-Muslims are allowed inside if properly dressed in the provided attire, a hijab and abaya (head scarf and robe). I just about passed out walking around in the polyester garments for 20minutes, in January no less; I have no idea how the women do that all day in July! The Petronas Towers (probably the only thing about KL that you’ve seen before) were pretty cool to look at, while the Somerset-type mall inside provided a nice reprieve from the downpour outside. Overall impression of Seoul: it’s well organized. The airport is amazing, and apparently there is a golf course somewhere inside… The subway, one of the most extensive in the world, as expected for the second largest metropolitan area (behind Tokyo), is extremely easy to use with well-planned numbering system and is the cleanest I’ve ever seen, and for less than a dollar you can get around to most sights. 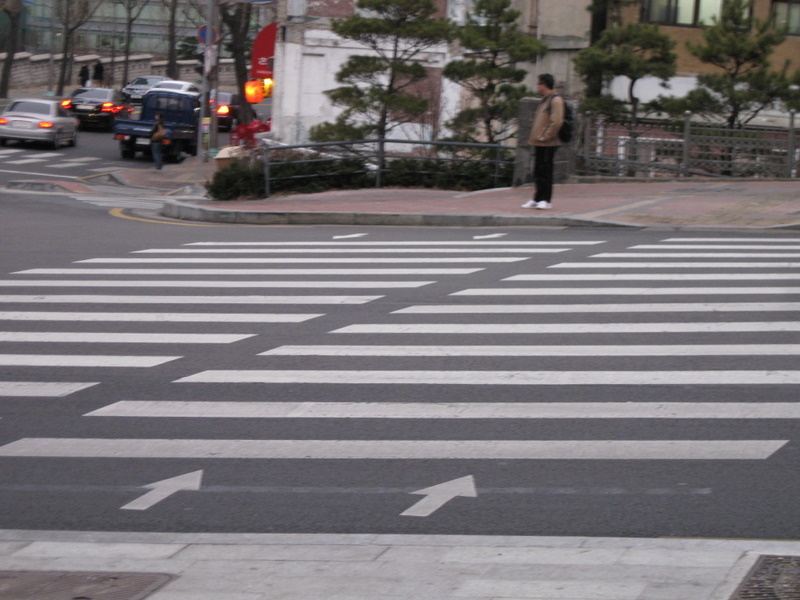 They even organize pedestrian crossings with arrows on the ground to keep traffic on the correct side. 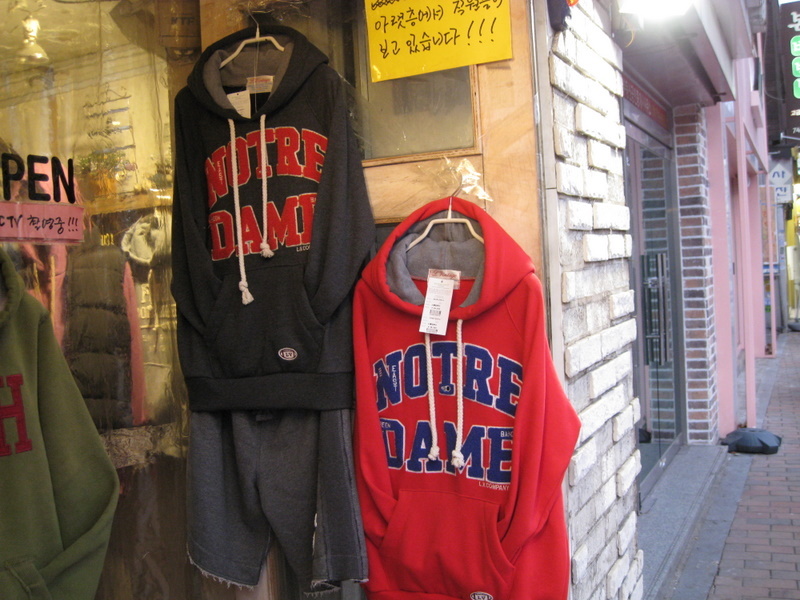 There are maps everywhere showing nearby attractions and where you are, which certainly helps me out until my sense of direction develops since the GPS on my phone won’t work internationally, and still puts me at O’Hare airport… However, Seoul gets major bonus points because I put extensive effort into finding Notre Dame stuff in Michigan, which was a fruitless attempt, and a shop a couple hundred yards from my hostel, proudly displayed theirs. 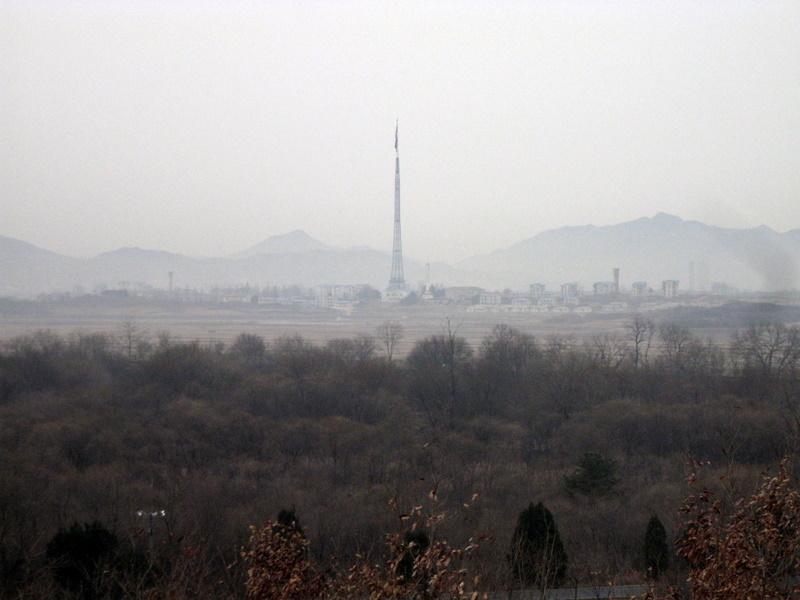 The highlight of Seoul for me was the USO led tour to the DMZ (demilitarized zone between North and South Korea). They took all of us to Camp Bonifas (US military base near the border) and the private did a brief intro into the politics behind the divide. 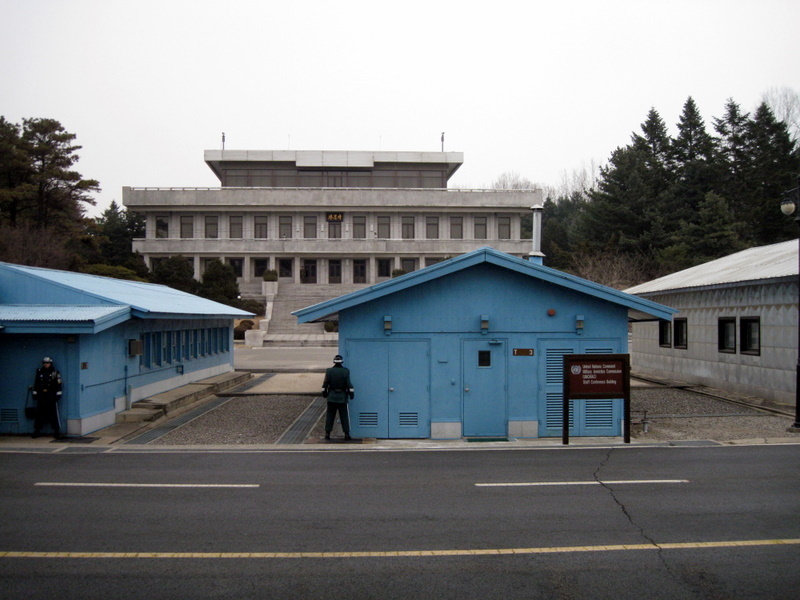 Then was the joint-security-area, which is what you’ve seen in pictures, guards staring each other down over the concrete dividing line. It wasn’t nearly as tense as I had imagined, especially because Kim Jong-il just recently died, leaving power to his youngest son, a situation that created a lot of uncertainty for the south. Anyway, it was still cool because technically I was briefly in North Korea (center of a conference table is the dividing line), though no North Koreans are allowed in the conference building is the South (or US) is occupying it and vice versa. Apparently the North has been digging tunnels in order to try to attack the South. So far four such tunnels have been found, and I got to walk through the third one. Just a normal tunnel: wet, smelly, and claustrophobic. You would think that government that is dealing with mass famine would reposition some of its massive military to more productive pursuits than burrowing underground for a mile, pretending it’s a coal mine. But when you put people in labor camps or jail for not “properly mourning the death of your leader”, you have different priorities. A much better use of my time, because I actually learned something, was the War Memorial of Korea – a museum dedicated to the ROK (Republic of Korea) military and its history. I think I spent close to four hours learning all about the Korean War, which despite getting A’s in history in high school, I knew nothing about. I had seen a bunch of huge displays in the subways touting travel to Norway, and didn’t see a connection, though they are definitely very pretty pictures of glaciers and whatnot. Then it became clear why they have such a “deep relationship” with Norway: the UN secretary general was Norwegian when North Korea attacked South Korea in 1950, and he supported UN intervention, even though Norway itself only sent medical supplies. The US, unbeknownst to me, once again shouldered the lions share of the support, while the rest of the world sat back. So once again, I’m taking off on an extended adventure. Already having done this before provides a good base line for planning, preparations, etc., even though so many things are different this time around. For one, I have a definitive plan for when I come home. Going back to school for my MBA provides a distinct direction for my life that I had been missing for a long time. Secondly, this time around I am headed out on my own. A few friends are planning on meeting up with me at various points on my trip, but on whole, I’m venturing it alone. Most people think that is crazy, but you meet a lot more people this way, which I’m hoping will enhance the whole travel experience. And thirdly, I am going to be working while on the road. Though it won’t be a typical 40-hour workweek, nor will the paycheck come close to that, it will definitely be an experience working on construction drawings from an internet café in New Delhi (a whole new take on outsourcing to India…). I look forward to both hearing from everyone on the road (and please do write because it will get lonely!) 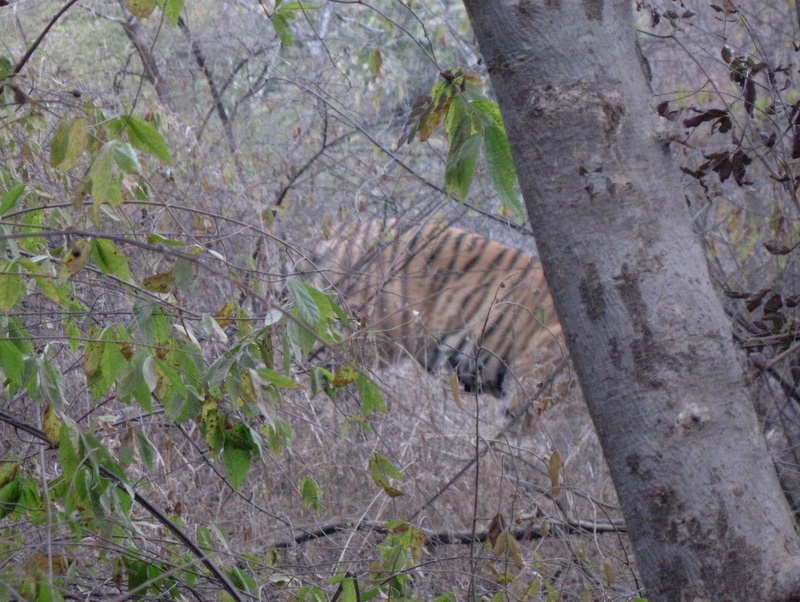 and sharing updates and pictures via this website with anyone interested enough to log on. I’m attempting to make my website “more user friendly”, so any comments or suggestions would be appreciated! 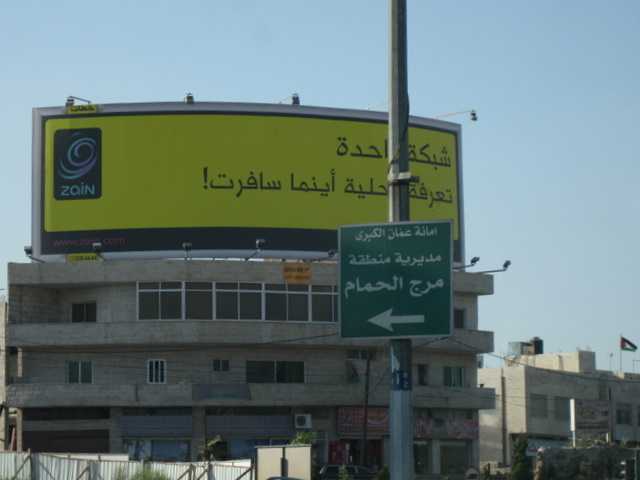 We ended up waiting at the Amman airport for about an hour and a half in order to take the public bus, to our executive suite at the Le Meridian – how about that for an oxymoron? You can imagine how utterly ridiculous we look walking in, where formal wedding receptions are taking place, with our backpacks… Once again, Matt’s days as a consultant proved beneficial when we were able to not only stay at a nice hotel, but get upgraded to an executive suite with all the benefits that the room affords. One of the privileges included access to the Royal Club Lounge, which again we looked very out of place among the executives in business suits in our raggy t-shirts and shorts. I can describe the process to get into the hotel now because I’m back home and won’t have to go through the process of allaying my mom’s fears. Because of the terrorist bombings at hotels that took place almost three years ago, to get into our hotel we had to go through metal detectors and have our bags x-rayed. Not to mention the unnerving sight of the well armed (automatic rifles strapped across their chests) guards in military fatigues pacing around the hotel perimeter. 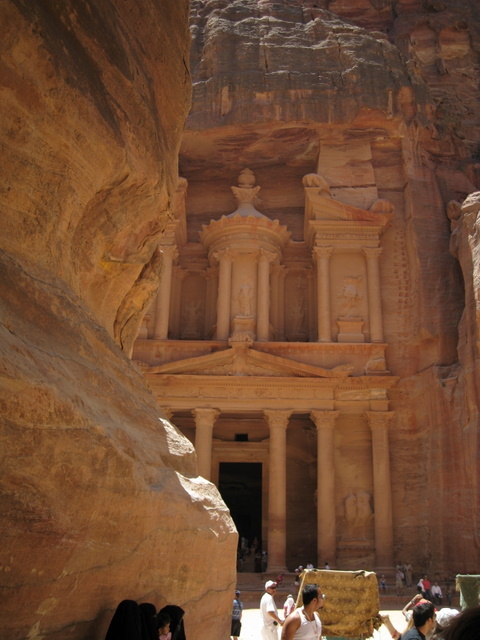 After a few “minor” wrong turns we arrived at Petra, one of the new Seven Wonders of the World. It is basically an archeological site of rose-colored stone and was used in ‘Indiana Jones and the Last Crusade’. From the entrance to the furthest point is about five miles, and allegedly only about five percent of the site has been excavated so far – basically it’s huge. We wandered around on foot to the major sites, despite the locals numerous attempts to get us to hire a “taxi” (donkey or camel). 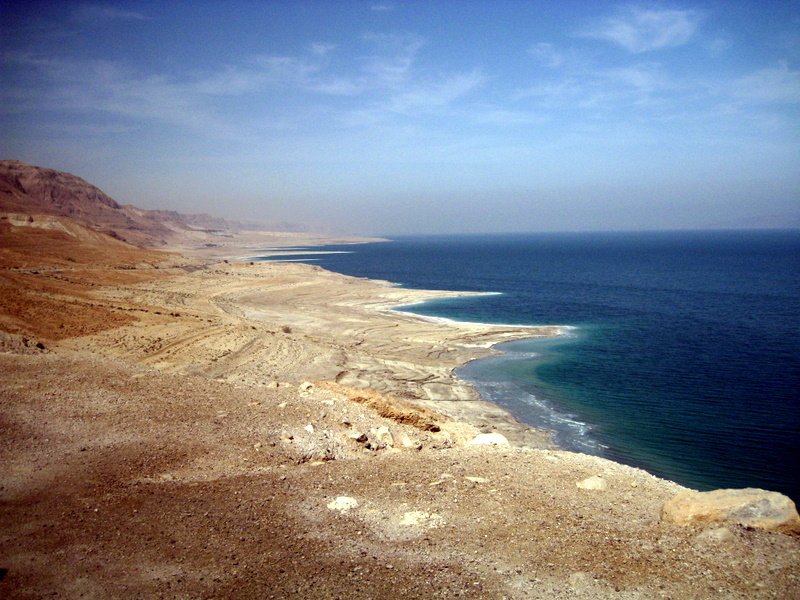 Getting through the checkpoints and the brief associated scare, we arrived at the Dead Sea. The water has a salinity of about 30%, which is about 8.5 times saltier than typical oceans. Because of the high salt content, no plant or animal life can sustain life – hence the name. It is quite a weird sensation to float in the water; it is impossible to sink, though very difficult to move around. 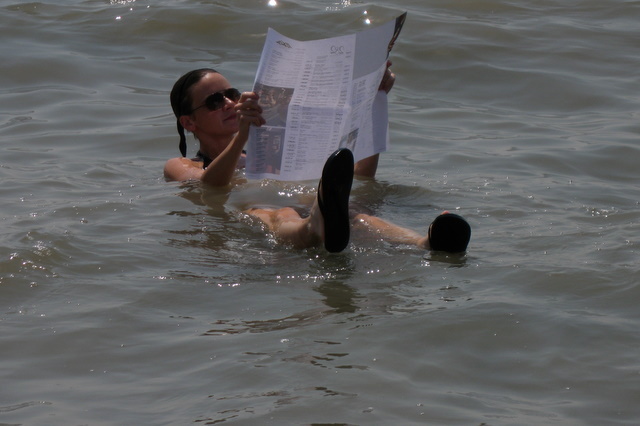 Trying to “stand up” in deep water, you still pop up so your shoulders are above the surface, then your legs gravitate to the surface as well until you are laying down comfortably as if on a raft. The water doesn’t even really feel like water; it’s closer to a gelatin type texture. All in all the Middle East was unlike anything I have ever witnessed before. I knew that women weren’t necessarily seen as being equal to men; however I had no idea to what extent it was still practiced by the general population. 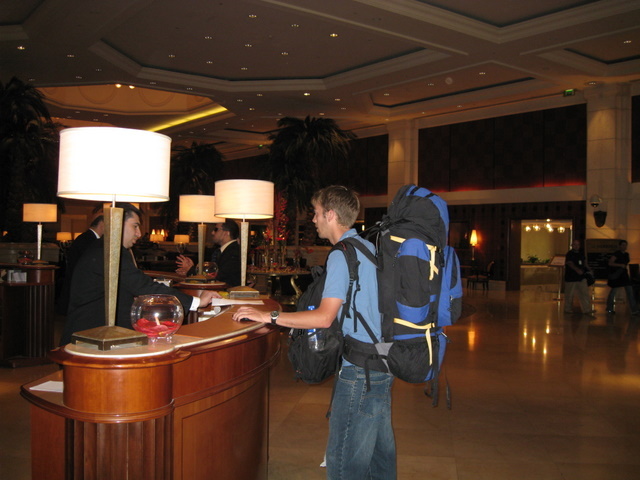 A good example was when Matt and I were in the taxi going to the airport: the driver asked what airline we were flying. I replied ‘Royal Jordanian’. The driver again asked what airline and added the preface ‘sir’. Apparently, my word wasn’t good enough for him… I also have never been anywhere that I didn’t dress conservatively enough in my regular clothes. Being among the veiled Muslim women, I felt that wearing capris might have been showing a “little too much skin”, but it was simply too hot for jeans. We left Istanbul to go to Dubai. But instead of flying southeast we flew northwest…to London. Then from London to Dubai. Apparently oneWorld thinks it is more profitable to send us on a 5 hour flight then a 7 hour flight, instead of one 2 hour flight. All of which had empty seats, but no L class. No wonder legacy airlines are having financial issues. 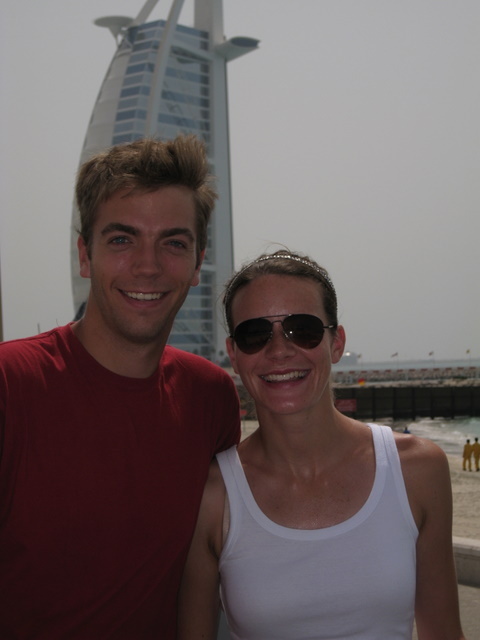 Dubai is just about the hottest and most humid place that we’ve been to on earth. Granted it was in August, but still, you sweat within 15 seconds of being outside, and I don’t even sweat that much to begin with. Not only is it hot and humid, the city is spread out along the coast, so it precludes anyone from walking around the city, except for us of course. I had never really seen pictures of what Dubai looked like, so I always pictured something like Coruscant (a Star Wars city/planet covered with huge buildings), but this was not the case at all. Dubai is still very much in its growth phase, with many buildings currently being constructed, including the Burj Dubai, soon to be the tallest free standing structure on the planet. Outside of the business district, you’d be hard pressed to see a building taller than 10 stories. Don’t get me wrong, Dubai’s exotic architecture and extravagance is an amazing sight to see and definitely well warrants a visit. Although, we do not recommend going in August, it is just too unbearable to be outside, and the sky was fairly dusty (don’t know what causes that). We hopped on a Big Bus city tour that took us to all the tourist hot spots, which in Dubai are basically the beach (which.. no), the 7 Star Hotel Burj al Arab (equipped with Helipad and costs $80 to see the lobby), the Mall of the Emirates with indoor skiing, another huge shopping complex, outdoor markets, and a couple museums. Now that you have the gist, the only thing to do in August is to go shopping. We went to go check out the Mall of the Emirates. 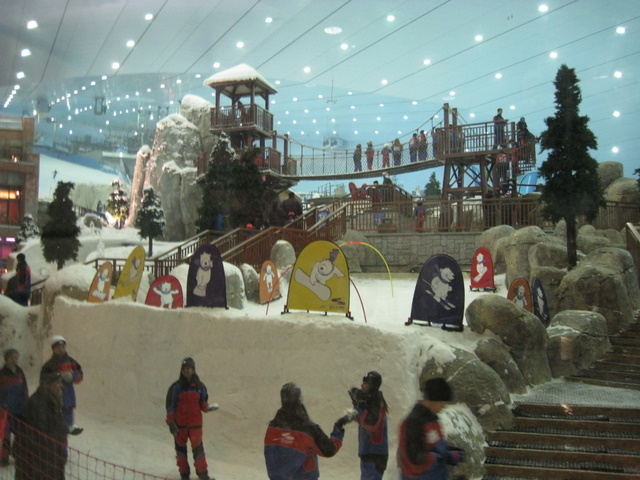 The indoor skiing is ridiculous. Just about everyone in the ski area probably hasn’t seen snow in their lives and a majority of the people just wanted to throw snowballs at each other. After that we had to catch the bus back before it stopped running. And of course the last stop was another shopping center. Here we needed a taxi to get back to the hotel. If you look at the picture to the right, you can see just how many people use taxis as their primary mode of transport, a taxi drivers dream – drive up, pick up, and go all in less than 3 seconds. Crazy business. Even old New York, was once New Amsterdam. Traveling from Romania to Turkey was a 20 hour odyssey fromBucharest to Istanbul in a vintage 1950s train car with no air conditioning with the summer sun beating in to the window from noon until dusk. We stayed not far from the famed Hagia Sophia and the Blue Mosque. Massive religious wonders. We paid the entrance fee to Hagia Sophia to get in as it was a museum, however, the Blue Mosque is a working mosque and I couldn’t get in because I wore shorts. 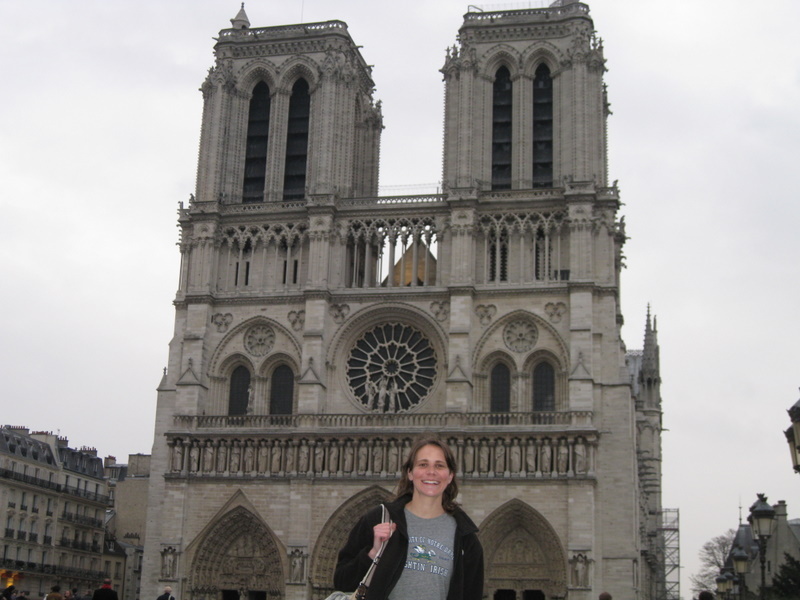 So Jill made it in, and of course probably played up how good it was to make me jealous (just like when we were in Rome and she was wearing a tank top and couldn’t get into a Cathedral so she borrowed my shirt to get in). 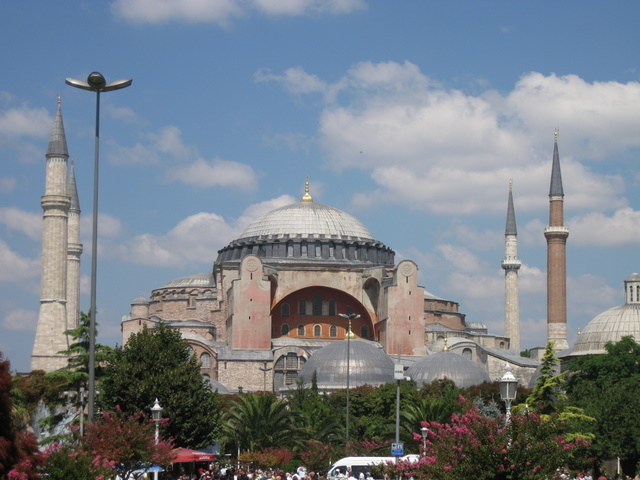 The Hagia Sophia is a mosque converted from a Catholic structure built in the 500s. Apparently the Turks plastered over the Christian mosaics, and have been partially uncovered recently. So you have both Muslim and Christian relics in one place. So Jill needed new sunglasses and we were at the Grand Bazaar, the largest covered market in the world, a giant place to buy jewelry, chess sets, upholstery, leather jackets, and sunglasses. Most of this stuff I would have to assume are knock offs. Anyway, Jill went to like 8 shops and found the same pair and her highest quote was 100 bucks and she bought them for 10. People are always trying to scam tourists. Turkish Delights. Yum! We made our way to a spice market in Istanbul. And they were selling tons and tons of freshly made Turkish Delights. I had no idea what a Turkish Delight was. After telling one of the store owners this, he offered us samples. We then repeated this process until we felt sick. It is a jelly type candy with nuts (usually). They don’t taste sweet, but they are made of sugar, so it’s weird. However, diagnosis…delicious. So we found out it is harder to get a Turkish Kebap in Turkey than it is in Germany. If you do find one, they are 2-3 times more expensive, with less meat, and don’t taste as good.